What could be healthier than eating fresh foods as they come into season? It is true that many foods are available year-round, but nothing is quite the same as the taste of new season produce being harvested at the proper time. Spring presents us with the first of the year’s vegetables - spring greens, baby potatoes and new outdoor rhubarb, not forgetting tender asparagus and lamb. 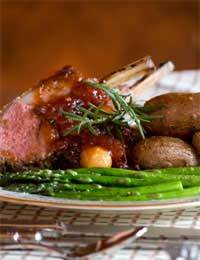 This is a delicious, low calorie recipe for Spring lamb. A perfect accompaniment is new season broad beans, with boiled brown rice to absorb the sauce. Trim any excess fat off the chops and remove the T-bones, or ask your butcher to do it for you. Put an apricot in the centre of each chop and wrap the meat around. Secure with wooden cocktail sticks. Mix the marinade ingredients in a jug. Lay the chops in a shallow ovenproof dish and pour the marinade over. Cover and leave for an hour. Before the hour is up set the oven to heat at Gas mark 6 (200 degrees C). Uncover the dish with the chops and bake for 20-30 minutes. At this point add the tomatoes and continue cooking for a further 10 minutes until ready. There is a wide choice of fresh ingredients in Summer, from soft fruits to peas and beans, and ripe courgettes and tomatoes. This very low calorie dish is nutritious and makes the most of the summer vegetables. In a heavy casserole, with a tight fitting lid, cook the onion and peppers in hot oil until tender. Stir in the mushrooms, aubergine and green beans. Add the beef stock and wine. Bring to the boil and reduce the heat. With the lid on, simmer for 8-10 minutes or until the vegetables are tender. Add the tomatoes (in their juices) and basil and heat through. Sprinkle each serving with grated cheese. Wild mushrooms, colourful squashes and pumpkins, and many of our favourite fruits mark Autumn in the culinary calendar. Plums are plentiful and this light recipe is an ideal way to use them. Place plums, sugar, crushed cardamom seeds and port in a saucepan. Bring to the boil, cover and simmer very gently for at least 30 minutes until plums are cooked and soft. Strain into a bowl. Leave the fruit to cool while you boil the juices for 3-4 minutes until they have been reduced to 3 tablespoons. Strain the juice into the plums and puree them in a food processor or blender. Fold in the custard. Spoon or pour the mixture into six glass dishes and chill for an hour. Top with cream or yogurt and decorate with a slice of plum. There is more fresh produce available in Winter than you might expect, particularly with vegetables. Serve this tasty, light Winter soup with crusty brown bread. Melt the butter in a large pan and add onion, potato and leek. Put the lid on the pan and sweat the vegetables over low heat for 15 minutes. Shake the pan occasionally. Add the stock, bring to the boil and reduce the heat. Leave the soup to simmer for 15 minutes until the vegetables are cooked. Add the milk and puree the soup. Return it to the pan. Season and reheat the soup gently, without boiling. Serve with a swirl of cream in each bowl.